The Permanent Representative of Bolivia to the OAS, José Gonzáles, highlighted that this is the first time that his country has organized primaries, and thanked the Organization for its support in the electoral process. "For us it is a learning process, it is the first time we have this kind of experience, and we are aware of the tradition that the OAS has in its observations in elections of this type, so we know that its accompaniment will be very healthy," added Ambassador Gonzáles. 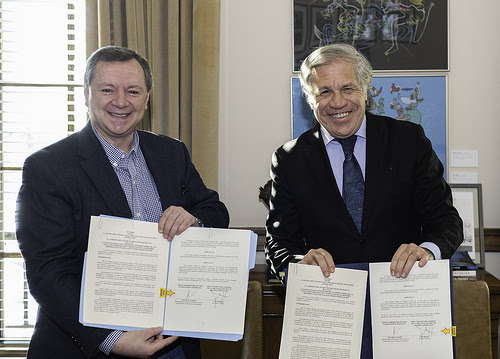 The Secretary General of the OAS, Luis Almagro, said that the Organization accepts the invitation to participate as observers "with pleasure." "At the General Secretariat we maintain our commitment to strengthening electoral institutions and processes, both in our Andean brother country and in all the countries of the region," said Secretary General Almagro. The Mission will arrive in La Paz on Monday, January 21. It will be composed of five specialists who will observe substantial aspects of the process in areas such as electoral organization and technology. Since 1966, the OAS has sent missions to 17 electoral processes in Bolivia.